Possessive Adjective | What Are Possessive Adjectives? I my I like my new car. you your You can leave your hat on. he his He accidentally cut his finger. she her She plays to her strengths. it its It will show its teeth. we our We have our reasons. they their They washed their hands. who whose Whose writing is this? My head goes woozy when you climb your ladder. Take his spoon and put it by your plate. It only wants its ball back. It is more helpful to group possessive adjectives and possessive pronouns under the term possessive form. 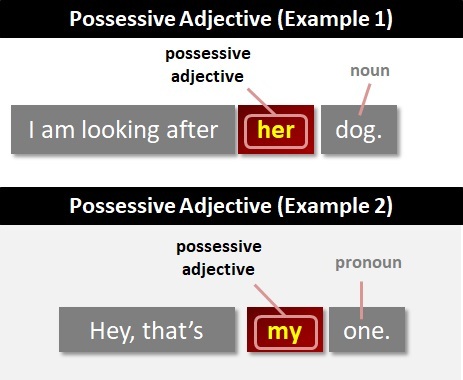 This helps to differentiate between possessive adjectives (e.g., my, your, her) and possessive pronouns (e.g., mine, yours, hers). There is no apostrophe in the possessive adjective its. Its has nothing to do with it's, which is a contraction of it is or it has. There is no apostrophe in the possessive adjective your. Your has nothing to do with you're, which is a contraction of you are. Read more about your and you're.